In 2014/15 STE is celebrating our 50th anniversary. Through the year we will be posting more of the history of Suzuki method string teaching, and the development of the Suzuki community in Edmonton. To download a copy of the 50th Anniversary Pamphlet and see all the events please click on the links below. This year the Society for Talent Education in Edmonton, Alberta, Canada is celebrating its 50th anniversary. This year’s Celebration Through Learning will culminate in a mass concert and family picnic in Edmonton’s Hawrelak Park on the weekend of May 30 and 31 featuring current STE students and faculty as well as STE alumni. If you have been part of STE as a parent, student or teacher we would love to hear from you at musicdirector@ste-suzukistrings.org or (780) 469-7382. We want to invite everyone to be part of our 50th anniversary celebration. To learn more about STE’s 50th Anniversary celebrations as well as our other current activities please visit our website at www.ste-suzukistrings.org. So far in the 50th Anniversary Celebration Through Learning we have held a Vital Violin Festival in November with special guests Brian Lewis and Laura Kennedy and a Charming Cello Festival with special guest Carey Beth Hawkett. In early April we have the Vibrant Viola Festival with special guest Elizabeth Steun-Walker and a Special Beginners Weekend at the beginning of May which will include the Betty Parker Jervis Concert, named in honour of one of our Edmonton Suzuki community leaders. The Society for Talent Education in Edmonton, Alberta is the oldest Suzuki program in Canada and one of the oldest in the America’s. STE was founded by Thomas Rolston, a visionary musician and pedagog. Thomas Rolston came to Edmonton in 1958 to teach at the University of Alberta, and take up the position of concertmaster and associate conductor of the Edmonton Symphony. In the summer of 1964 Thomas Rolston traveled to Japan, met Shinichi Suzuki and observed his teaching. As soon as he returned to Edmonton he and a group of like minded people set up the Society for Talent Education and arranged to have Yoko Oike, a student of Dr. Suzuki in Matsumoto, move to Edmonton and start teaching. The program started with two one week sessions at the Banff School of Fine Arts in July 1965 attended by 23 students and their parents. In September 1965 Miss Oike started lessons with 40 students at Grace Lutheran Church in Edmonton . She was joined by Mrs. Joan Lord, who working very closely with her, started another 40 students in October. Suzuki Method had arrived in Edmonton! In July1965 Yoko Oike, a student of Dr. Suzuki, arrived in Canada and launched the Edmonton program with two one-week sessions at the Banff School of Fine Arts. Twenty-six children and their mothers attended. In the summer of 1966 the Society for Talent Education received a grant from the Canada Council for the Arts to bring two more Japanese teachers who had trained with Dr. Suzuki to Canada. In the fall of 1966 Yasuko Tanaka and Tomoko Otsuka. joined Yoko Oike. These three teachers taught approximately 140 children. In the fall of 1968 Mr. Gordon Richardson introduced the cello programme. Due to the unavailability of very small cellos at the time the children had to be between 5 and 6 years of age to be big enough to manage the available instruments. In 1971/72 Claude Kenneson assumed leadership of the cello program and cello parties. He was joined in 1975 by Mitsuru Sato from Japan. In 1970 an STE orchestra was started under the direction of Mr. Thomas Rolston; “the only orchestra where very few could reach the floor when seated on the edge of their chairs”. Later that year the orchestra program was taken over by Mr. Ernest Kassian and in 1971/72 expanded to three orchestras with the addition of Mr. Lawrence Fisher, Mr. Michael Bowie and Mr. Harry Hill. In 1977 STE started a three year in house training program given by the teachers from Japan and Korea who had studied with Dr. Suzuki. Currently quite a number of the senior teachers in STE are graduates of this early excellent long term teacher training program which was modelled on Dr. Suzuki’s teacher training program in Matsumoto. In the fall of 1980 STE started a viola program under the direction of Mr. Michael Bowie, and a few years later in 1986 started a bass program under the direction of Mr. Ioan Tetel. From that point on STE has offered Suzuki instruction from the very beginning in all bowed string instruments. Edmonton’s Society for Talent Education program has interacted with the national and international Suzuki community on quite a number of occasions. Following Mr. Rolston’s visit to Dr. Suzuki in 1964 the Suzukis followed what happened as the STE program in Edmonton developed and visited Edmonton on several occasions. The Edmonton Suzuki program was met with nation-wide interest and helped with the organization of other societies nationally and internationally: most notably in Calgary, AB (1967), then Bellingham WA, Hamilton ON, Regina and Saskatoon SK, Vancouver and Vernon BC and Amsterdam (Holland). 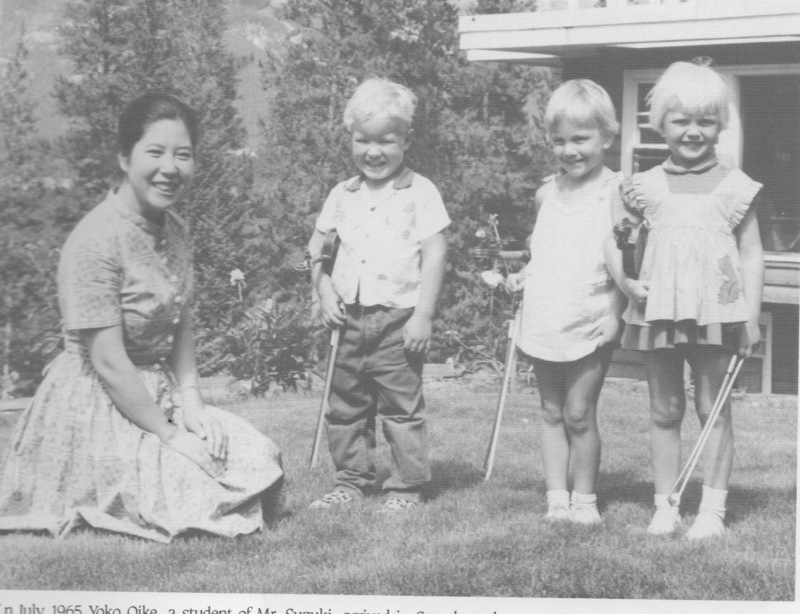 In July of 1968 Mrs. Suzuki visited Edmonton and met many of the children and families involved in STE. In June 1977 an international workshop was held in Edmonton and was attended by Dr. and Mrs. Suzuki and over 300 Suzuki families and teachers from all over western Canada. In 1983 a group of teachers, parents and students from STE traveled to Japan and Korea and attended the 6th Suzuki International Conference. The students performed Miniatures for Violin and Piano by Alberta composer Violet Archer, which was commissioned by STE for the occasion. Following their attendance at the 6th Suzuki International Conference members of STE went to work planning and organizing to host the 7th Suzuki International Conference. The 7th Suzuki International Conference was held in Edmonton in 1985 and was attended by Dr. and Mrs. Suzuki and1700 teachers, parents and students from Canada, the US, Europe and Japan. Supporting the idea of year round daily practice STE held frequent summer workshops and programs, most notably during the summers of 1972 and ’73 week long workshops at the Banff Centre for the Arts under the direction of Miss Yasuko Tanaka and Mr. John Kim. In 1987 the first Suzuki Institute was held in Edmonton co-sponsored by the U of A Music Dept. and STE. The Alberta Summer Suzuki Institute has been held biannually and is still the principle summer program of STE. During the 1983 tour to Japan and Korea the parents and teachers from Edmonton observed Suzuki kindergartens, especially the kindergarten in Dr. Suzuki’s program in Matsumoto. When they returned to Edmonton they began to promote the idea of a Suzuki kindergarten within STE. In 1985 the kindergarten opened with 18 students and 2 teachers. The kindergarten proved very successful and gradually evolved into a private elementary school with kindergarten, split grade 1/2, 3/4 and 5/6 classes. All subjects were taught following Suzuki philosophy and principles and all student families were part of the STE string program. In 1994 the Alberta government enacted legislation which allowed the creation of charter schools. STE applied and was granted a charter for it’s elementary school. Now the Suzuki Charter School has become a public elementary school offering kindergarten to grade 6 education following the Suzuki philosophy and pedagogical model to more than 250 students all of whom also study violin, viola, cello, bass in STE or piano, flute, recorder or guitar in one of the cities Suzuki programs. Since the very beginning STE has been involved in making music in the greater Edmonton musical community. The first big performance of STE students in the community was in October of 1969 when 25 STE students performed with the Edmonton Symphony Orchestra on an Adventures in Music concert under the direction of ESO music director Lawrence Leonard. From that point on STE students have been frequent performers with both the Edmonton Youth Orchestra and occasionally with the Edmonton Symphony, or at concerts in the lobby before ESO concerts. STE students also frequently perform throughout the community in hospitals and seniors homes, at local farmers markets and in formal concerts in City Hall, the Alberta Legislature as well as other public events and spaces in and around the city. Over the past 50 years the Society for Talent Education and its students have become an established part of Edmonton’s cultural fabric. STE has also become a vital part of the Canadian Suzuki scene. STE, with now over 300 students and 20 teachers, is one of the largest Suzuki programs in the country. The Alberta Summer Suzuki Institute is one of the largest Suzuki Institutes in Canada and offers the most opportunities for Suzuki teacher training in western Canada. Our alumni play in major orchestras both in Canada and around the world. STE has much to be proud of over the last 50 years and, looking forward, the potential for a rich future.